The State Jal Boards supply water for limited duration in a day. Time of water supply is decided by the management and the public does not know the same. In such a situation, this water alarm circuit will save the people from long wait as it will inform them as soon as the water supply starts. foil. You can assemble the sensor by rolling aluminium and plastic foils in the shape of a concentric cylinder. Connect one end of the insulated flexible wire on the aluminium foil and the other end to resistor R2. 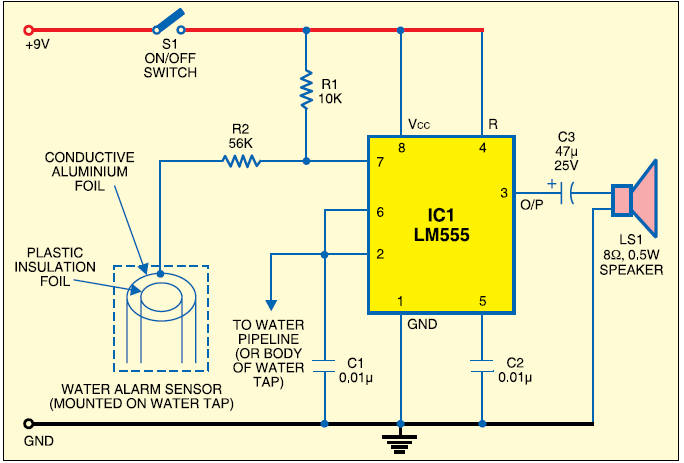 Now mount this sensor inside the water tap such that water can flow through it uninterrupted. To complete the circuit, connect another wire from the junction of pins 2 and 6 of IC1 to the water pipeline or the water tap itself.